Halloween is my favorite holiday. While Christmas still trumps it when it comes to food, Halloween is king when it comes to fun. I mean, ghosts, ghouls, vampires (non-sparkly ones) and zombies? Sign me up! Unfortunately, my new role as mom to a very active baby leaves me with little time to enjoy the festivities. 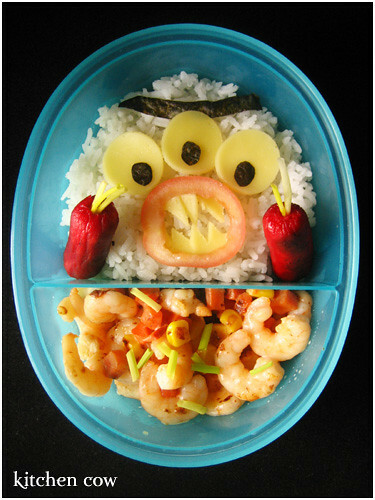 So, instead of preparing a bento, allow me to put up a round up of scary bentos from Halloweens past and share a rousing Happy Halloween to all! 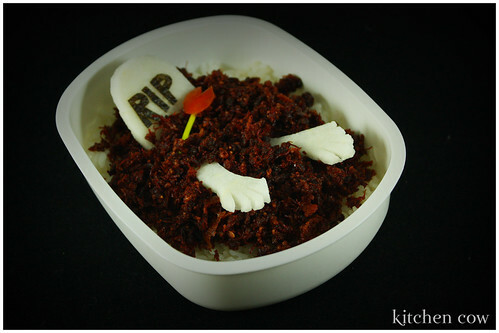 The dead are rising from their graves in this bento. All in the pursuit of wonderful brains of course! I crafted the skeleton from a quail egg, cut nori sheets and jicamas (singkamas). The tomb stone is made of jicama, too. The brain? It was a no-brainer (pun sorta-kinda intended) with umeboshi (Japanese pickled plum). Oh and the ghosts are pillowy soft marshmallows with nori, too. I’ve got my eye on you with this bento. Correction, make that eyes. I find eyeballs creepy so it didn’t take me long to see how scary this is. (Hardeharhar. I’m killing myself with the puns.) 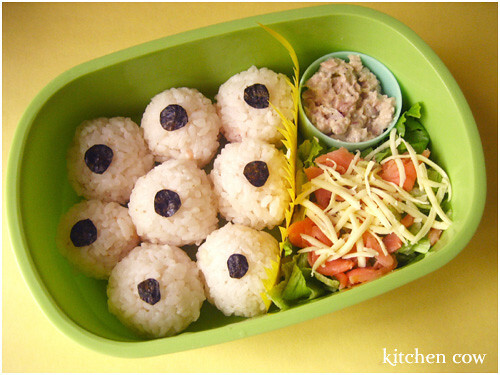 These eyeballs are actually round onigiri stuffed with cream cheese and smoked salmon. A circle of nori acts as the pupil, transforming an innocuous onigiri into a creepy eyeball. Carrie-themed, from beyond the grave bento. This one is made from crispy corned beef soil, jicama arms and tombstone (I love jicamas! ), nori letters, and a tomato and spring onion flower. Totally creepy yet totally yummy! If you want to make a dessert version, crushed Oreo cookies would do nicely, too. Sea Monstaaaar in a bento. Inspired by The Simpsons and the Powerpuff Girls, this sea monster is an original made in rice. Cheese and nori eyes (and unibrow!) let him see, while his mouth is made with a tomato slice and cheese teeth. Cocktail hotdog claws and spring onion nails complete the look. Horrifying? Well, let’s just say yes. Don’t let him hear you say he’s adorable!